Khalil Mack, of course, was absent Monday against the Los Angeles Rams. So was the Raiders’ pass rush. ALAMEDA, Calif. — Khalil Mack, of course, was absent Monday against the Los Angeles Rams. For the most part, so was the Raiders’ pass rush. The defense totaled five quarterback pressures all game, the fewest of any NFL team in Week 1, according to Pro Football Focus. The total was uncharacteristically low for the Raiders. They recorded five or fewer pressures just once in Mack’s 64 career games since 2014. The lone outlier came in Week 6 of 2016. 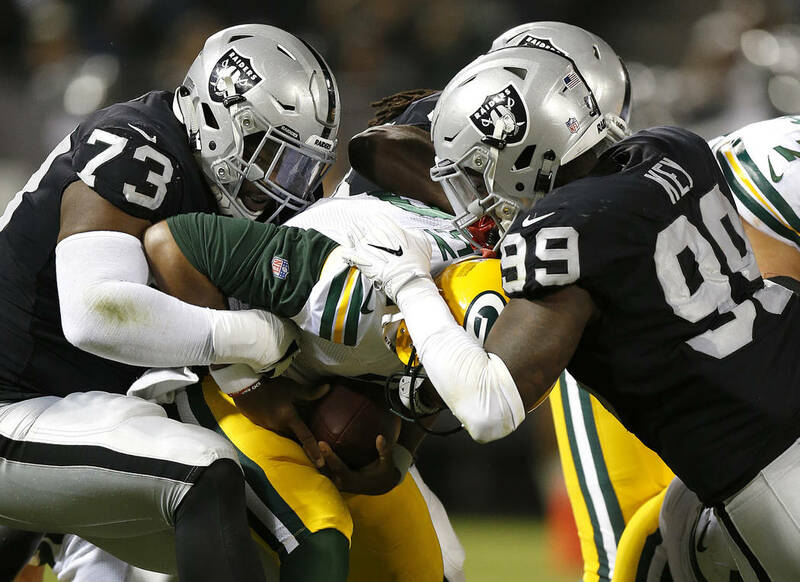 The Raiders managed three pressures when the Kansas City Chiefs attempted a season-low 24 dropbacks on 64 offensive plays. Here in 2018, much of the team’s pass rush falls on the rookie class. The Raiders drafted defensive linemen P.J. Hall in the second round, Arden Key in the third and Mo Hurst in the fifth. A learning curve is only natural. The Raiders look to continue to give Key opportunities, Gruden added. He said that the Rams presented “eye candy” with some of their play-actions, jet sweeps and running game. Key acknowledged postgame that quarterback Jared Goff rolled out of the pocket more than he anticipated. ■ Long snapper Andrew DePaola suffered a season-ending right knee injury in the first quarter. On Tuesday, the Raiders scoured for a replacement, hosting several free agents for a workout. They are expected to sign rookie Trent Sieg, sources said Tuesday evening. He spent training camp with the Baltimore Ravens. Tight end Lee Smith served as the emergency snapper after DePaola exited. ■ Wide receiver Johnny Holton was signed to the practice squad. He was waived last week to create roster room for wide receiver Brandon LaFell. Wide receiver Keon Hatcher served as a special-teams flyer in Holton’s place. Defensive back Terrell Sinkfield was released in a corresponding move. ■ Defensive linemen Justin Ellis and P.J. Hall suffered foot and ankle injuries Monday, respectively. Their availability Sunday against the Denver Broncos is unclear. ■ Safety Karl Joseph played only seven defensive snaps, his lightest workload since he first saw NFL action on defense in Week 3 of his rookie season. “He’s going to get on the field more,” Gruden said of the 2016 first-round pick. “It’s just a matter of time. It’s the first game. I don’t want to read too much into it. The Rams are a diverse, complex offense. We chose to go with a unit that we felt gave us the best chance. But you’ll see more of Karl in the coming weeks.” Reggie Nelson and Marcus Gilchrist started at safety.